The mid-size pickup segment is growing but still, the full-size models dominate the sales chart. The mid-size models are easier to maneuver, more efficient and can tow significant loads probably more than most buyers need. The mid-size trucks, as the full-sizers, come in many configuration options and range from utilitarian ones to premium versions. When speaking about the premium versions, the Canyon Denali stands out with its true premium features. The 2019 GMC Canyon Denali is the upcoming version of this top-tier trim variant and GMC will improve several aspects of the new model. There won’t be radical changes and the powertrain options remain but GMC addresses several important features. The old infotainment system is replaced with the newest version of the system and features. GMC also introduces new color options while also adds a digital rearview camera and rear park assist. The new power-adjustable driver seat also appears in the Denali trim and SLE, All Terrain and SLT. The 2019 model year doesn’t bring substantial styling or structural upgrades. The Canyon continues with familiar tall grille and the same shaped headlights. To the look also adds sculpted fender flares and high belt line. The model changes the style of the grille in each trim and also bumpers and moldings vary with the new trim version. The 2019 GMC Canyon Denali builds its look with Denali’s signature styling. The dominant element is Denali-branded signature grille executed with the chrome and mesh pattern. The model also has body colored bumpers and chrome fog light bezels. The headlights come with attractive LED signature lighting. 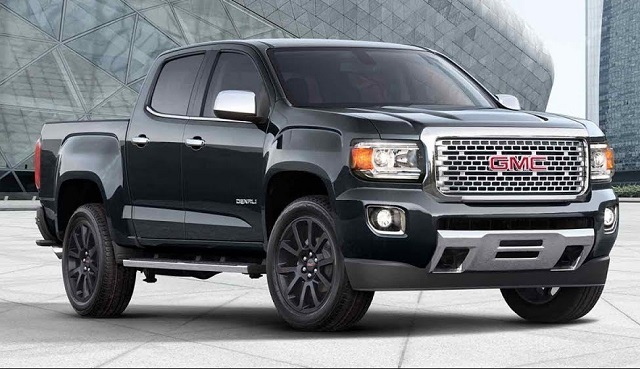 The Denali trim also augments the look with the attractive 20-inch ultra-bright aluminum wheels. The 5-inch chrome assist steps and more chrome on the door handles, windows, mirror caps also hints the premium class. Inside the cab, the Canyon Denali is also the class of its own. It has the same layout and the controls arrangement but lifts the material quality and number of premium features to the sky. The specially executed seats provide long ride comfort and have unique premium leather and stitched upholstery. The front seats also come with heaters and ventilation. The premium materials also continue on the dash and door panels. The leather-wrapped and heated steering wheel is also the part of the package. 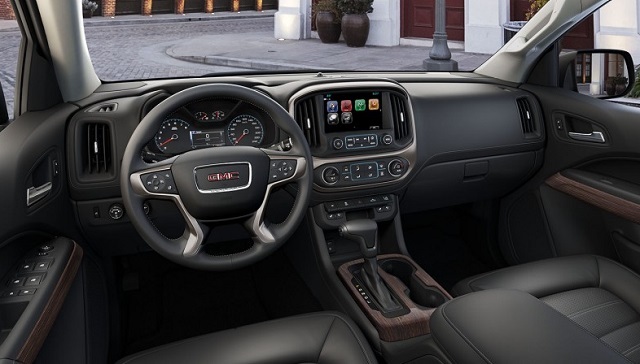 The Denali trim also gives the attention to the details and nice contrasting accents spreading through the cabin. The Canyon Denali also includes loads of technology and GMC brings the newest version of the infotainment system for the new model year. The new system should provide more intuitive and personalized user interface alongside the smartphone compatibility features, upgraded voice recognition, permanent 4G LTE connection and automatic updates. The Denali also includes the premium Bose sound system, navigation and more. The new Canyons also have the new digital rear vision camera instead of the current analog device. The Denali is also standard with the Driver Alert package. It covers lane departure warning, forward collision warning but misses the auto brake feature. On the performance front, the 2019 GMC Canyon Denali returns with the standard V-6 engine. The base 2.5-liter that makes 200 horsepower isn’t available in the top-tier Canyon but the smooth and efficient Duramax turbo diesel comes as an option. The 3.6-liter V-6 provides 308 hp and torque of 275 pound-feet of torque in the combination with the 8-speed automatic transmission. The V-6 delivers superior power but isn’t the towing and efficiency leader. The V-6 powered Canyon returns 20 mpg combined and allow up to 7, 000 pounds of towing. If more torque and better towing are needed the Duramax diesel engine will deliver and also provide the more efficient ride. The 2.8-liter Duramax turbodiesel four-cylinder engine pumps 186 horsepower but lifts the torque to 369 pound-feet. More torque translates to better towing capability and the Duramax-powered Canyon goes up to 7, 700 pounds. The Duramax engine also brings a better fuel efficiency and returns 25 mpg combined or 30 mpg highway with the rear-wheel drive. The all-wheel-drive version is slightly less efficient with 23 mpg combined. If you want to get the best from the new mid-size Canyon, the 2019 GMC Canyon Denali will hit the market in the upcoming months. The all leather, wood, premium features, signature styling and capability don’t come cheap and the Denali version will start from $40, 300.